Bluff Harbour with Bluff Port and township, viewed from Bluff Hill. Oreti Beach and New River Estuary distant left, Invercargill City distant right. 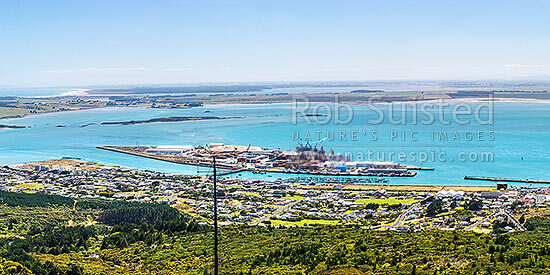 Panorama, Bluff, Invercargill District, Southland Region, New Zealand (NZ), stock photo.